Monetary Policy in the U.K. In my previous post, I suggested that the best way to assess monetary policy is by comparing the target variable to the target. This is the only proper way to evaluate the stance of monetary policy. Interest rates and monetary aggregates might be useful guides, but they are only intermediate targets. An explicit target is also important because it helps to anchor expectations. As a result, I have been watching monetary policy in the U.K. closely. The Bank of England undertook quantitative easing while maintaining their explicit inflation target. In addition, they provided guidance as to their target for nominal income growth as well. The reason that one should be interested in the Bank of England is because they are following a policy roughly consistent with those advocated by folks like me, David Beckworth, Scott Sumner, Bill Woolsey, and others: anchor expectations with an explicit goal — preferably for nominal income — and use quantitative easing when interest rates fall near zero. Another quarter, another surprisingly strong U.K. growth figure. Growth of 0.8% in the third quarter smashed the consensus estimate, pitched at just half that level, and also demolished any thought that the Bank of England might move towards more quantitative easing at its meeting next week. The U.K. economy is looking resilient. The U.K. economy has now expanded 2.8% in the last year, a little above the average for the pre-crisis decade of 2.6%. Encouragingly, growth is broad-based across services, construction and manufacturing; the latter has now racked up annual growth of 5.3%, the strongest year-on-year rise for 16 years, Barclays Capital notes. Despite concerns, service-sector growth held up at 0.6%, the same pace as the second quarter. Indeed, worries that the U.K. is experiencing a particularly bumpy recovery are starting to look overdone. That should help unlock corporate spending and hiring. Investors hadn’t expected such strong growth: sterling shot up against the dollar and 10-year gilt yields rose more than 10 basis points as markets judged that more BOE bond purchases were a vanishing prospect. Of course, the fiscal tightening set out in last week’s comprehensive spending review may drag on growth in coming months. But there is no case for the BOE to be loosening policy now, with inflation stubbornly above target and nominal growth close to 6%; Citigroup notes this means that policy makers are above the trend growth rate of 5% that the BOE targeted in undertaking round one of quantitative easing. In other words, the Bank of England has shown us that QE works. How should one evaluate the stance of monetary policy? This is the burning question that underlies all the arguments for and against more expansionary monetary policy. If the current discourse among economists is any indication, there are wide-ranging views as to how to properly evaluate the stance of monetary policy. Part of the problem is that the assessment of monetary policy is the United States is inherently difficult. The Federal Reserve has no explicit goal for monetary policy. As a result, the stance of monetary policy is usually determined by a particular variable (or set of variables) that are able to capture most effectively the transmission of monetary policy. For Keynesians, this is often the short-term interest rate. For monetarists, the indicator is money balances. For many supply-side folks, the key indicator is commodity prices; namely, precious metals. Thus, when the central bank doesn’t have an explicit nominal target for monetary policy, there are many ways to assess the stance of policy. But what happens if the central bank has an explicit target? where P is inflation and P* is the 2% target. If inflation exceeds the target rate, monetary policy is too loose. If inflation is less than the target rate, monetary policy is too tight. It is literally that simple. Don’t believe me? Pick up a UK newspaper (or just read it in your web browser). The Bank of England has an explicit target for inflation. As a result, when one reads financial news in UK newspapers, assessments of monetary policy are always framed in the context of the inflation target. The MPC’s mandate makes it clear the best contribution it can make to economic growth is via stable prices, specified in terms of a 2pc target for CPI inflation, Mr Sentance said. However, latest inflation figures this week showed that inflation remained at 3.1pc in September, exceeding the Government’s 3pc limit for a seventh month. “The current period of above-target inflation risks being prolonged by monetary policy which is too lax – creating a climate in which higher inflation is not just the product of one-off shocks but becomes more deeply ingrained,” Mr Sentance said. Search the article. There is no mention of money growth or commodity prices. The only mention of the interest rate is in reference to whether or not the Bank of England should increase the interest rate to stem rising inflation — there is no mention of whether the current interest rate implies that monetary policy is too loose or too tight. So why am I wasting all of this time talking about what happens under an inflation targeting regime when there is no such target in the United States? Because the worst kept secret in the world is that the Federal Reserve has an implicit target for inflation of 2%. It would therefore make sense for us to start assessing the stance of monetary policy in terms of the implicit target. If inflation is below 2%, then the monetary policy is too tight. I am puzzled why others are thinking in different terms. For example, Stephen Williamson seems to suggest that the inflation risk is on the upside and that Bernanke is using “Phillips curve logic.” While I share Williamson’s displeasure with the Phillips curve, I am skeptical of his evidence. 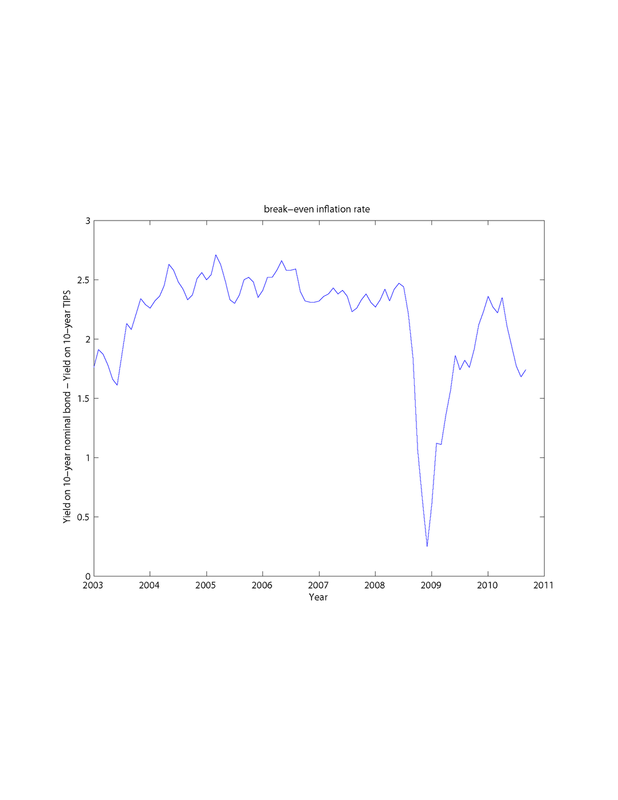 For example, he plots M1 and currency to show that the rate of growth has increased recently for each. This is fine, but M1 does a poor job of forecasting inflation — at least post-1979 (Divisia M1 does a good job). In addition, this ignores what is happening to velocity and, for the analysis of currency, the money multiplier. I know that Williamson disdains the equation of exchange, but sole reliance on monetary aggregates is not always sufficient. In addition, Williamson plots the TIPS spread for the 10-year Treasury and suggests that inflation expectations are close to 2%. 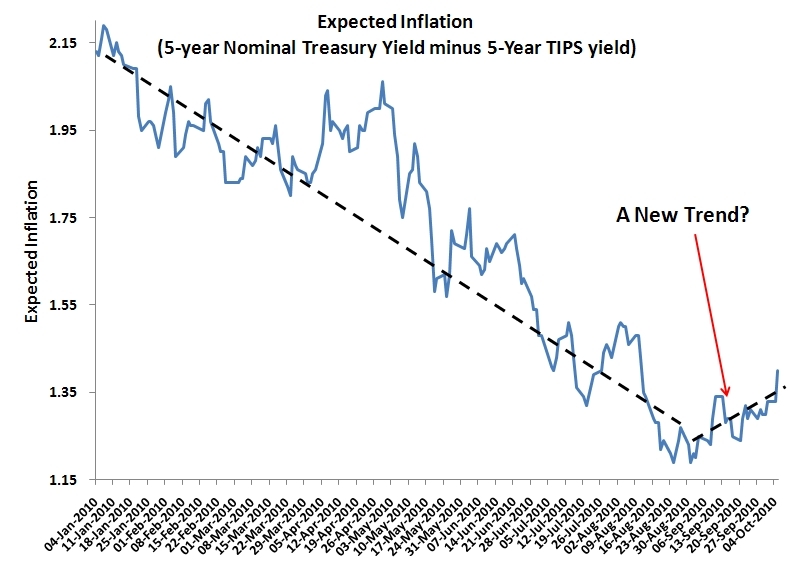 Of course, if one looks at the TIPS on the 5-year Treasury as David Beckworth has done, expected inflation is below 1.5%. I should note that I believe that it is important to look at other monetary indicators to provide guidance as to the future path of inflation — as Williamson is clearly indicating. However, when there is an explicit target (or an implicit target that really isn’t that implicit), the main indicator of the stance of policy should be the deviation of policy from its target. Speaking in Boston on Saturday, [Evans] said the Fed should consider using a temporary target for the level of prices instead of the rate of inflation in order to drag the economy out the trap by convincing businesses and consumers to stop saving and start investing and ­spending. Such a move would be in addition to a fresh asset purchase programme, or quantitative easing, now under consideration. “I think there are special circumstances when price-level targeting would be a helpful complement to our current and prospective strategies,” Mr Evans said. In the price targeting that Mr Evans described, the Fed would promise to generate enough extra inflation to make the price level the same as if prices had risen by 2 per cent a year since December 2007, which was the peak of the last business cycle according to the National Bureau of Economic Research. As soon as the Fed reached that goal it would abandon the price level target and go back to targeting inflation of about 2 per cent a year. As I have said before, I would favor a target for the level of nominal income, but a price level target will suffice. Also, it seems like the Fed’s implicit inflation target is growing more explicit by the day. Might we see an explicit target once the economy recovers? Why Couldn’t Woodford Be Vice Chair of the Fed? [Quantitative easing] would be a dramatic move. But we must not kid ourselves. It would have at best a modest effect in a large, liquid market such as Treasury bonds and, therefore, is unlikely to dig the US economy out of its current hole. There is, however, another option: for the Fed to clarify its “exit strategy” from its current, unconventional monetary stance. This would mean making clear that the Fed has no plans to tighten policy through increases in the federal funds rate, even if inflation temporarily exceeds the rate regarded as consistent with the Fed’s mandate. In short, the Fed should allow a one-time-only inflation increase, with a plan to control it once the target level of prices has been reached. This proposal is different from that made in some quarters (and rejected by Fed officials) for an increase in the Fed’s inflation target. In order to obtain the benefits just cited, it is not necessary to make people expect a continuing high rate of inflation. Indeed, that would be counterproductive. To the extent that expectations of a permanently higher inflation rate would create uncertainty about the value of the dollar, for instance, they could easily make long-run real bond yields higher, rather than lower. Critics will say this will undermine the Fed’s credibility on price stability. They are wrong because the price increases allowed under this “catch-up” policy would be limited in advance. Catch-up inflation would simply put prices back on the path they would have followed had the Fed been able to cut interest rates earlier. The instinct of policymakers such as Mr Bernanke is to say less about future policy during a time of economic turmoil, on the grounds that the future seems especially difficult to predict at such times. Yet it is precisely when policymakers face unprecedented conditions that it is most difficult to assume that the public will be able to form correct expectations without explicit guidance. At times like the present, uncertainty about the future is one of the greatest impediments to faster recovery. Although I would prefer a nominal income target rather than a price level target, the latter will suffice. Woodford does an excellent job explaining the implications of level targeting as well as the importance of expectations. More importantly, as David Beckworth notes, this view seems to be making inroads at the Fed. Like the hardy band of hobbits who brought the ring to Mordor, our little group of bloggers from schools like Texas State, Bentley, The Citadel, Wayne State University have finally succeeded in bringing NGDP targeting (level targeting no less!) into the formerly impregnable Federal Reserve System. Kudos to Matt Yglesias as well. And of course level targeting-advocate Michael Woodford, who in all seriousness does have influence at the Fed. I am assuming Scott is Frodo, so who does that make me? The paradox of thrift is generating a considerable amount of attention this week. I’ll give a brief summary of the debate and then my thoughts. He is alluding here to the Paradox of Thrift, the idea that if everyone tries to save–which makes sense individually–during a recession, then aggregate spending will fall. Let me explain why the Paradox of Thrift is really just an excess demand for money problem. First, individual households can save three ways: (1) by cutting back on consumer spending and hoarding money, (2) by spending income on stocks, bonds, or real estate and (3) by paying down debt. In the first case, all households attempt to increase their holdings of money by cutting back on expenditures. However, if there is a fixed amount of money this will create an excess demand for it and a painful adjustment process will occur. If , on the other hand, the Fed adjusts the money supply to match the increased money demand then the painful adjustment is avoided and monetary equilibrium is maintained. Yes! There is no paradox of thrift. There is a paradox of hoarding the medium of exchange. That’s because there are two ways to buy more money: sell more other things; buy less other things. One of those two options is always open to the individual, but not to everyone. The *only* case where Say’s Law is wrong is when there is an excess demand (or supply) of money, the medium of exchange. The hole in David’s argument is, I think, where he says “the Fed adjusts the money supply” without saying how. Suppose that we have a situation–like we have today–where people are trying to cut back on their expenditure on currently-produced goods and services in order to build up their stocks of safe assets: places where they can park their wealth and be confident it will not melt away when their back is turned. They switch spending away from currently-produced goods and services and try to build up their stocks of safe assets–extremely senior and well-collateralized private bonds, government securities, and liquid cash money. Now suppose that the Federal Reserve increases the money supply by buying government securities for cash. It has altered the supply of money, yes. But it interest rates are already very low on short-term government paper–if the value of money comes not from its liquidity but from its safety–then households and businesses will still feel themselves short of safe assets and still cut back on their spending on currently-produced goods and services and the expansion of the money supply will have no effect on anything. The rise in the money stock will be offset by a fall in velocity. The transactions-fueling balances of the economy will not change because the extra money created by the Federal Reserve will be sopped up by an additional precautionary demand for money induced by the fall in the stock of the other safe assets that households and businesses wanted to hold. Regardless of what anyone has said to this point in the debate, the key to understanding the differences between folks like David Beckworth, Nick Rowe, and Scott Sumner and those like Brad DeLong and Paul Krugman is encapsulated in a key assumption made by Lloyd Metzler (that persists in the New Keynesian framework). In Metzler’s analysis, bonds and capital are assumed to be perfect substitutes. As a result, we can focus all of our attention on the interest rate. Monetarists and quasi-monetarists, however, do not accept the view that the sole effect of monetary policy is given by its effect on “the” interest rate. This was the primary source of criticism of Monetarists of Keynesian models. Brunner and Meltzer spent a great deal of time and effort emphasizing that exclusive focus on the interest rate could be misleading. In fact, if you read the papers in Jerome Stein’s Monetarism, it is clear that this is the central focus of the debate from the monetarist perspective — although not from the Keynesian perspective. What’s more, the paper in that volume by Tobin and Buiter even notes that a useful extension to their model would be to drop Metzler’s assumption. Thus, it is not that David and Nick haven’t read Metzler, it is that their framework implicitly, if not explicitly, rejects Metzler’s assumption. Relative prices matter. P.S. Much of the New Keynesian paradigm, at least that espoused by Woodford, highlights the importance not only of actual central bank policy, but expectations about central bank policy. For a discussion about expectations, see this post by Scott Sumner.